Aimed rocket fire at Gruber was awful and the only damage was a dirty great hole in the potential landing strip. At the same time Craig was dropping oil drums and Pioneers out of the back of his truck and the troops north of the farm were making slow but steady progress. Gruber then suppressed my rocket team with 20mm cannon fire and at this point I declared that I would reveal my 6pdr and attempted to blow Gruber to smithereens. Awful dice rolling or alternatively 'lack of familiarity or experience in handling the weapon' resulted in abject failure. This only encouraged the German 81mm mortar team to shell the barnyard with gay abandon. 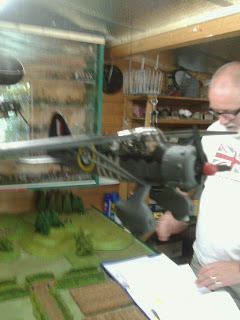 Meanwhile to the West one of the Boyes crew met his demise whilst the motorcyclists in the open also became casualties. Of partisan rifle fire from the orchard. 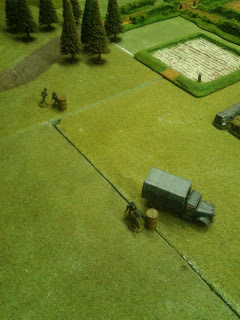 Craig seized a chance to split my forces forecast sending his APC between the orchard and the farmhouse. However as his men debussed into the orchard they were met by small arms fire from the upstairs Windows of the farmhouse suppressing the MG crew in the open topped vehicle and driving some of his battle hardened troops to ground. As the attention of the partisans in the woods had been drawn by the APC and the squad it carried, the pioneers continued to lay down oil drums of what I suspected to be High Explosives. I was also notified that a squad of Royal Marine Commandos who had been expected for some time had appeared at the far South Western corner of the table. Freshly recruited (painted) the team of 10 emerged from the woods with the instructions to make their way to the farmhouse. (The exact entry point was entirely random based in dice throws). 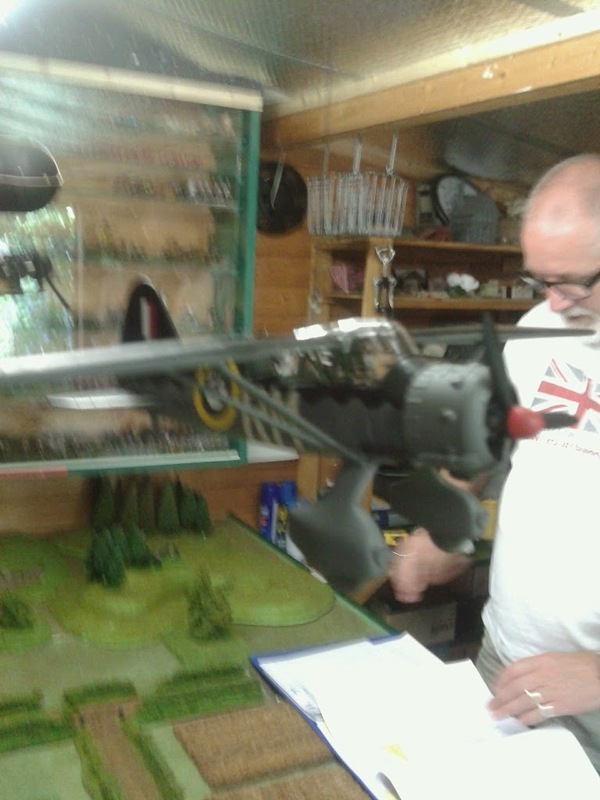 At the same time German reinforcements also appeared on the table. 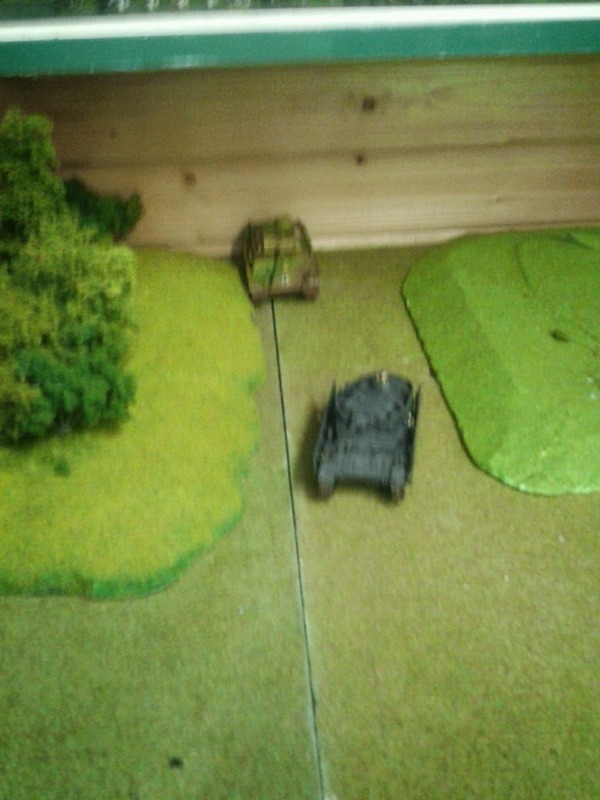 Straight from the repair depot and rushed with great haste to support this operation a prototype Panther and a Panzer IV G lumbered onto the table. Unfortunately for my commandos they appeared on the road right by the side of the woods that the the Commandos had just exited. Bad fortune goes both ways however and the Panther immediately rolled double 1 on 2d6. Whoever had been responsible for the refit had obviously put put more attention into the paint job rather than the engine. The engine misfired then stalled and then died with no hope of recovery. To the North a Hanonag turned a corner rather too closely to an inauspicious looking milk churn which was then detonated by hard wired plunger. 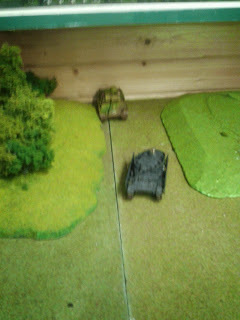 Losing the front wheel the APC shuddered to a halt. My suspicions proved true when the oil drums were set off by pencil fuses. The clear intent was to crater the runway. 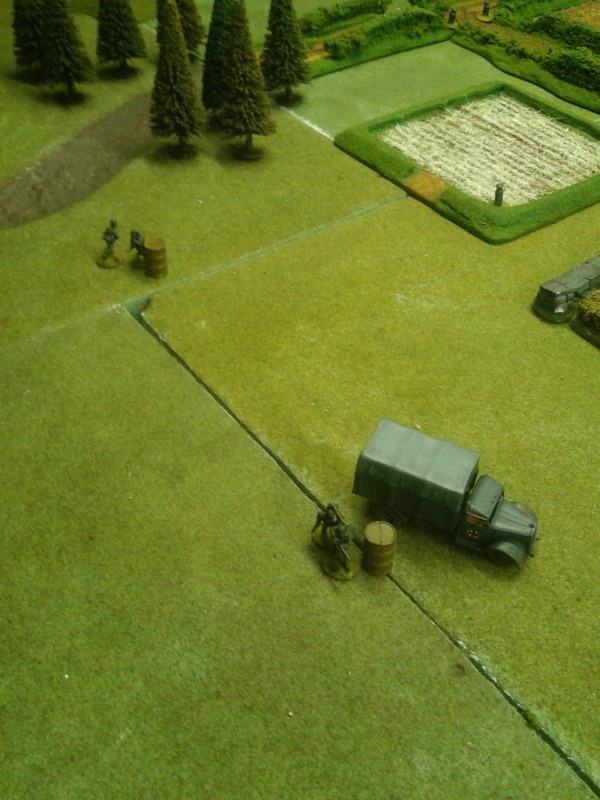 I exchanged fire with the Panzergrenadiers in the orchard and rushed and killed one in hand to hand combat. My glee was short lived as a well thrown grenade took out 3 of my partisans. To the east another squad of 5 Partisans left the barn and ran west to support their colleagues in the orchard.